Whether you need a simple one to three page brochure style website or a full-blown e-commerce store with a shopping cart and checkout payment option, we’re here to help. We know it can be frustrating wading through all the options available to lay out your website for optimum performance, and that’s where we come in. If you’ve never had a business website before, the options can be confusing. There are multiple types of websites, each with its unique strengths and weaknesses. Choosing the right website is important to maximizing the benefits of your online presence. This type of website is simple and serves to showcase your services or products, provide contact information, and as means for customers to contact you. It is commonly considered to be similar to a business card. These websites usually lack any functionality. • The purpose should be clear. Consider what you want to convey with a simple website. When your potential customer visits your site, she should know what your business is all about. • Your contact information should be easy to find. Consider having it on every web page. Many websites almost seem to hide the contact information on purpose. • It should include examples of your best work or products. A great brochure website will showcase your best offerings in an attractive, and easy to use format. • Your contact information should be easily found. • Consider having forms on every page. Give your web visitors every opportunity to provide their contact information to you. • Include testimonials, if applicable. Using photos with your testimonials is even more powerful. Build credibility whenever possible. • Consider giving something in return for your visitors filling out a contact form. This can be a free report or other informative document. If you’re actually selling a product or service online, then an e-commerce website is for you. Functionally, these websites can be considerably more complicated to create and implement, but you’ll have the equivalent of a full-time employee selling for you 24/7. • Give your customers the ability to fill out contact forms, but don’t require them. Many people loathe filling out forms. Allow your customers to purchase without requiring them to register. • If you have numerous offerings, a search function is very helpful. No one wants to click through 12 pages of products looking for the right one. 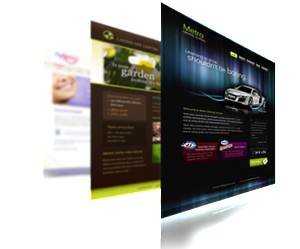 • Integrate your website with social media. There’s rarely a good reason not to be connected with Twitter and Facebook, at a minimum. Whether you like it or not, social media is popular. Ensure you have the right type of website for your needs. Each website has a specific purpose, but they all share the ability to collect customer contact information. Building an email list is important; there’s a lot of money in a good list. We’d love to assist you with the design and implementation of your website, so let us know if you’d like to see our website portfolio and get some expert advice about how to build the best website for your needs.